truth, honesty, and some made up rules stated as absolutes. Brian Cant taught us lots of things. THERE’S MORE THAN BRIAN WAS LETTING ON. The web is all about sharing just ask Humpty and Jemima. this is why we publish it All data is potentially useful to someone else. Data is only useful if it’s correctly described but we’ll come onto that in a bit. Metadata is everywhere Often hidden away, but doesn’t deserve to be. The more exposed metadata is, the more useful it is and the more useful the original data becomes. Rule #1 Beware dark data. Rule #1 Beware dark data. Hidden data gets forgotten and goes out of date. Rule #2 The more you lie, the less you can be trusted and the less valuable your info becomes. Rule #2 This is something Brian Cant taught us. Rule #3 The fewer distinct consumers, the less valuable the metadata becomes over time. Rule #3 Search engines can no longer trust keywords, descriptions Abuse has spoiled it for everyone Brian Cant never said anything about that. Humans like patterns too we like routine we like repeating patterns robots like patterns because they are repeatable we like patterns because we don’t want to think thinking is hard, uncomfortable and inconvenient. Brian Cant never knew this but I bet he’d be thrilled. 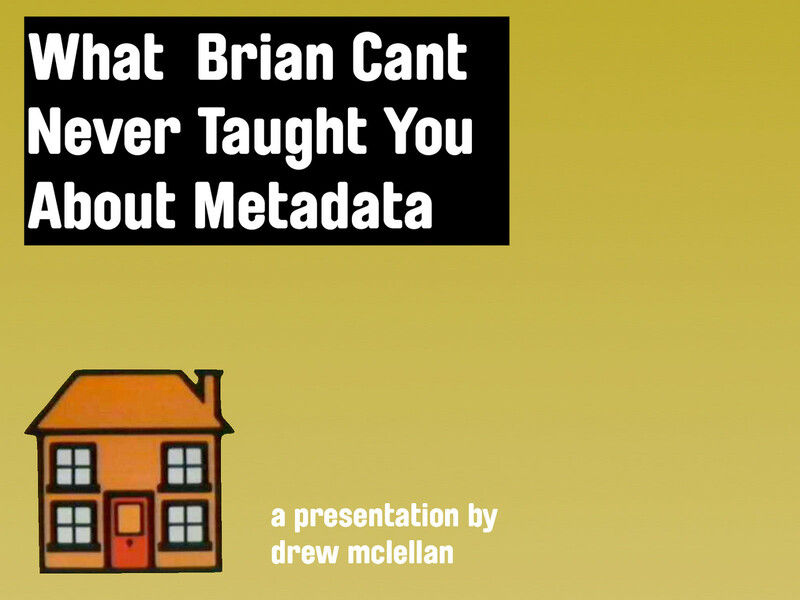 View What Brian Cant Never Taught You About Metadata on Notist. Or "Everything You Know About Metadata is Wrong". Or "How I Learned to Stop Worrying and Love The Data". It's a presentation about metadata, HTML, robots, 1970s/80s children’s television programming, tofu, truth, honesty, and some made up rules stated as absolutes. An audio recording and transcript of the presentation.